Conversion LogixArjencia WaterCoin & Professional Equip. Company (Tucson)Vilar Vending, Inc. The timing for taking on a leadership role may not always come when we hope or expect. Many of us work from strategic plans, some through succession planning, others simply hoping to get noticed by those that can promote them. And then, sometimes life and business just happen and we must adapt. These times can, and I dare say should, be looked at as opportunities to challenge our own ideas of what we thought possible! There are so many ways to serve within the AMA that can help you develop a strong network within our leadership. We have been challenged to draw on that bench of current and past leaders for additional support. It’s been an important reminder of the critical importance of cultivating talent and training them for the future. Our growing Flagstaff membership offers another opportunity to take on a leadership role. The AMA Flagstaff Mixer drew an enthusiastic group. We had several leaders volunteer to launch a Flagstaff Coalition Committee. Our members there also expressed interest in more networking and education programming for Northern Arizona. I hope you will read through the Flagstaff Mixer recap for more information on those efforts as well. AMA Tribute finalists demonstrate their leadership within their organizations every day. Based on their talents and style, they have earned this recognition and this month we celebrate each finalist for their contributions! Congratulations to all the Tributes finalists! 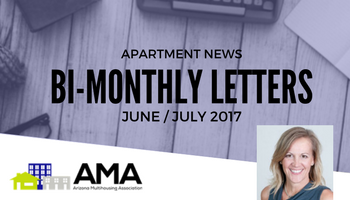 This letter was originally published in the June/July 2017 issue of Apartment News, the official print publication of the Arizona Multihousing Association. To order copies of this magazine, contact the AMA. Amy is managing partner at Flagstaff-based property management firm Bella Investment Group and board chair for the Arizona Multihousing Association.